A dozen or so startups are developing high-resolution radar chips that use various modulation schemes and processes, such as CMOS, FD-SOI and even metamaterials. In theory, high-resolution radar could boost the capabilities of today’s radar for cars, as well as eliminate the need for a separate LiDAR system. But the technology is still in the research stage and has yet to be proven commercially. In a car with assisted- or self-driving capabilities, a vehicle may incorporate three sensor types—cameras, LiDAR and radar. Using pulsed laser light to measure distances, LiDAR (light imaging, detection, and ranging) can accurately identify objects, but it’s expensive and has some limitations in weather conditions. Radar uses radio waves to detect objects and is less expensive than LiDAR. But it also has trouble discerning actual objects, which is why companies are racing to develop high-resolution or imaging radar. Today’s radar chips work for current applications, but there is a need for better radar in more advanced vehicles. NXP, for one, is beginning to offer solutions for high-resolution radar, which are being tested in vehicles. It’s too early to tell if high-resolution radar will pan out, let alone displace LiDAR. And high-resolution radar, which isn’t a new technology, has its own issues. For years, defense/aerospace, meteorology and other high-end sectors have used high-resolution radar. But bringing this technology into the automotive market is challenging. In automotive, chips must meet stringent cost, power and safety specs. 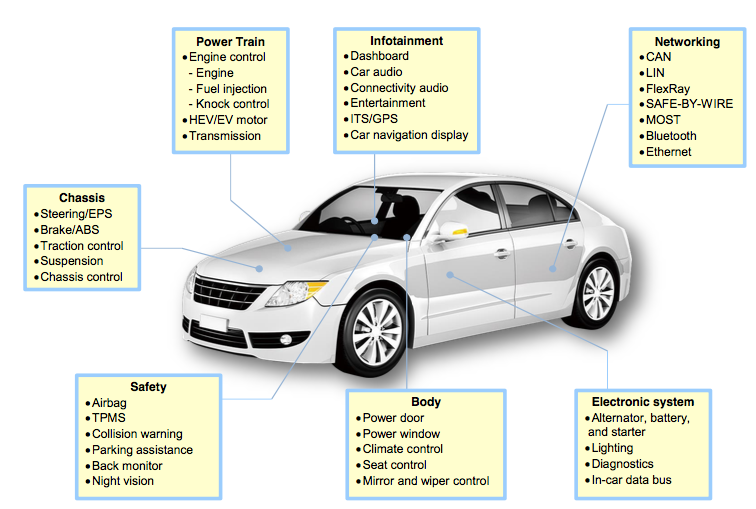 Generally, the automotive industry divides a car into five main domains—body, connectivity, fusion/safety, infotainment, and power train. Fusion/safety consists of cameras, LiDAR and radar. These technologies are targeted for both advanced driver-assistance systems (ADAS) and autonomous driving technology. ADAS involves various safety features in a car, such as automatic emergency braking, lane detection and rear object warning. Today, in some high-end models, a vehicle typically incorporates cameras and radar. Generally, LiDAR is too expensive for most vehicles. For those cars, OEMs use short- and long-range radar. Adaptive cruise control and automatic emergency braking use long-range radar (LRR). For LRR, the radar module is located in the front center of the car. Front-facing LRR operates at millimeter-wave frequencies at 77 GHz at a range from 160 to 200 meters. Located in the back corner of the car, the SRR module is used for lane detection. As vehicles move toward more advanced ADAS functions, SRR radar is evolving from the 24 GHz to the 79 GHz band. In simple terms, radar transmits electromagnetic waves in the millimeter range. The wave signals bounce off objects and are then reflected back. The radar system then captures signals to discern the range, velocity and angle of an object. For automotive radar, the industry uses a mmWave technology called frequency modulated continuous wave (FMCW). “FMCW radar transmits a frequency-modulated signal continuously in order to measure range as well as angle and velocity,” according to Karthik Ramasubramanian, radar systems manager at Texas Instruments. FMCW radar is good at detecting objects at nearby wide angle views at acceptable resolutions. Generally, the technology is relatively inexpensive and isn’t affected by weather conditions. It also has some drawbacks. “Radar does not precisely reproduce the obstacles and features in the surrounding area,” said Alex Lidow, chief executive of Efficient Power Conversion (EPC), a supplier of gallium-nitride (GaN) chips. EPC supplies GaN devices to Velodyne, a supplier of LiDAR systems. For basic safety features, FMCW radar is suitable. But as OEMs move toward more advanced ADAS features, they want sensors with more and faster capabilities. For this, OEMs can go down several paths. First, they could add more radar modules to the car, but this doesn’t solve the resolution-limited issues with FMCW. LiDAR has some drawbacks, as well. “LiDAR uses GaN and other technologies to generate the laser and optics around it. It’s very expensive,” Fransis said. So for now, there is no one technology that does everything. Some OEMs might use all technologies—cameras, LiDAR and radar—for redundancy purposes. Others have different philosophies. For example, Tesla doesn’t use LiDAR because it’s too expensive. Instead, Tesla’s vehicles incorporate cameras, ultrasonic sensors and radar. Ultrasonic sensors measure the distance to an object via sound waves. So how does today’s radar and LiDAR compare in resolution? And how much further does radar need to progress to match or surpass LiDAR? Based on these metrics, radar has a way to go to close the resolution gap with LiDAR. High-resolution radar will narrow the gap, but LiDAR is also advancing, meaning radar is chasing after a moving target. So which technology—LiDAR or radar—will ultimately prevail? “We predict that both these sensors and cameras are going to continue to play equally important roles in the ongoing autonomous vehicle revolution,” Monroe said. Meanwhile, a number of companies have recently emerged in the high-resolution radar chip front. These companies include Arbe, Autoliv, Echodyne, Metawave, RADSee, Steradian and others. In addition, NXP is pursuing it. Imec, an R&D organization, also is working on it. Vendors are taking various approaches. Some are developing souped-up versions of FMCW. Others are developing multiple-input, multiple-output (MIMO) technology. Bringing this technology into the cost-sensitive automotive market isn’t going to be easy, though. NXP and others are helping to bring the technology up to speed. 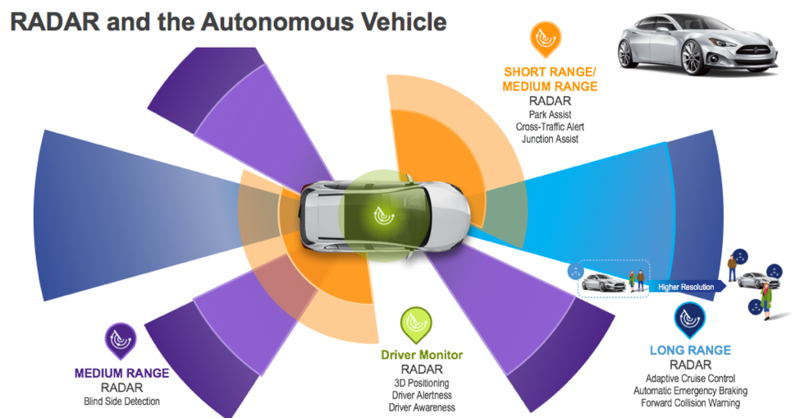 “NXP is working closely with partners to validate performance and refine next-generation products to continuously drive radar sensors to the maximum performance,” NXP’s Knebelkamp said. But as OEMs add more ADAS features in the vehicle—such as collision avoidance and others—they will require better radar. Used in aviation, meteorology and radar guns, Doppler radar produces velocity data about objects at a distance. Arbe, a fabless chip maker, is developing a three-chip solution, which includes a transmitter, receiver and a radio processing unit. Specified at 79/80 GHz, the device is based on a 22nm FD-SOI process from GlobalFoundries. Arbe’s technology takes some of the elements of military radar and implements it in an FMCW scheme. Specifically, the technology uses some aspects of synthetic-aperture radar (SAR). Using successive pulses of radio waves, SAR is used in military systems to create 2D/3D images of objects. In systems, SAR radar looks sideways. That won’t work in automotive, where radar needs to look forward. FMCW is limited, so the industry requires some new innovation. “Our novelty is a new method of FMCW that will make it work with (a number of) antennas,” Marenko said. Another startup, Steradian Semiconductor, is developing a 28nm CMOS-based, mmWave imaging radar device based on a version of FMCW. Then, in another approach, Imec is developing automotive radar devices based on MIMO. Imec has developed a 79 GHz radar device and is now working on 140 GHz technology. Both are based on 28nm CMOS. Meanwhile, startup Metawave—a spinoff from Xerox’ PARC—is developing a different solution that combines elements of SAR military radar, metamaterials and artificial intelligence. The technology, dubbed Metamaterial Frequency-Adaptive Steering Technology (M-FAST), resembles MIMO, but it’s different. Metawave’s radar steers a directive RF beam that can determine the location and speed of road objects in all-weather conditions. The company also found a way to overcome the issues with SAR. In SAR, the radar moves in a mechanical fashion. “In our case, we are not moving the radar mechanically. The beam itself is moving. We are electronically steering the beam. By electronically steering the beam, we are capable of reconstructing the scene. That’s means we are stitching all of the different snapshots taken by the beam,” he said. Amid the emergence of high-imaging radar, LiDAR is making progress. For example, Velodyne recently introduced a LiDAR system with 128 laser beams. The system is 70% smaller with twice the range and four times the resolution of the previous 64-beam model. There are other innovations. UMC, for one, is working on technologies to enhance LiDAR imaging. UMC is not making the photodetectors for LiDAR. “Our 28nm/22nm RF team is working on mmWave-based LiDAR imaging that can fulfill the specifications required for 5G as well as deliver the cost advantages that these sensor products demand,” said Steven Liu, vice president of marketing at UMC.